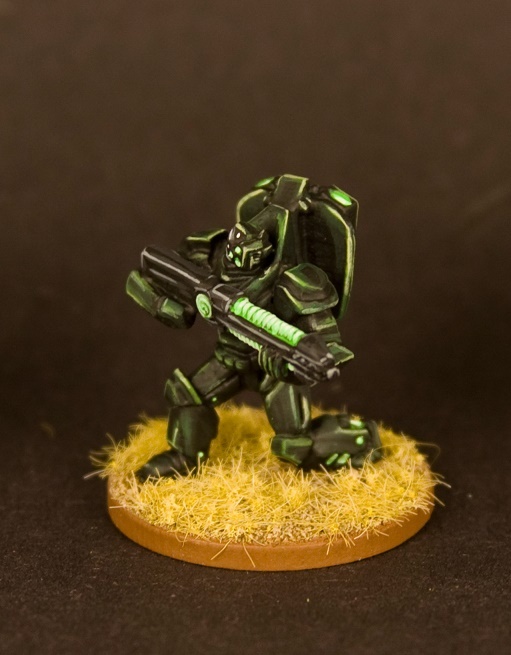 The HADES Wraith team is the advanced combat squad of the Hunter/Ambush Discreet Engagement Section. 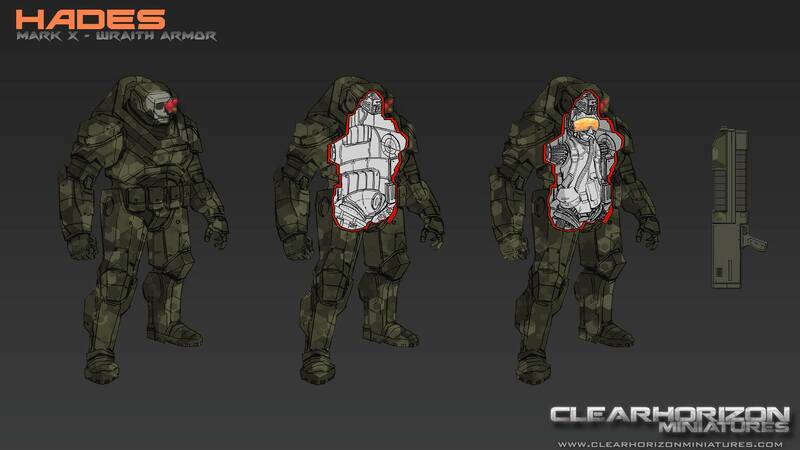 Each Wraith Powered Armor suit contains advanced stealth systems that allow the Wraith team to infiltrate almost any target undetected. Wraith teams can also survive hard vacuum and dangerous environments for extended periods of time, making them ideal for infiltration deep behind enemy lines or sabotage missions aboard enemy spacecraft. Each Wraith team member in their armor stands approx. 12 feet tall and carries either a standard Mk 14 60mm directed energy railgun or a squad support Scythe 180mm directed energy railgun. Either advanced railgun accelerates a variable-formed nano-tech projectile up to 4500 m/s and can be used in anti-personnel, anti-vehicle or anti-structure roles. 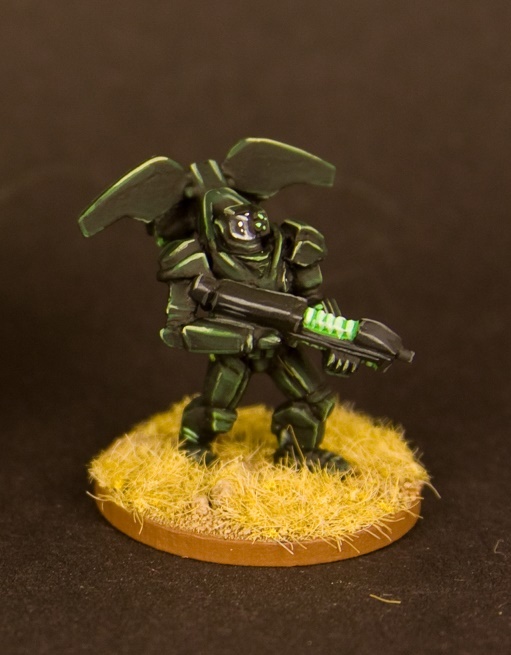 The HADES Wraith team is able to be dropped from high orbit and, using an advanced jump pack, transverse great distances without on-planet vehicle or aircraft support. As each Wraith Powered Armor suit must be controlled via a direct neural link and nerve wiring, Wraith team members are extensively modified. Each limb has been cybernetically replaced and extends inside the suit openings, connecting via hardened cables. The operator is able to exit the suit if it becomes damaged and the cybernetic limbs will automatically retract to a more standard size. A personal rifle along with other survival supplies are stored in the back of the suit to ensure the operator has a weapon and supplies available if the suit becomes inoperable. 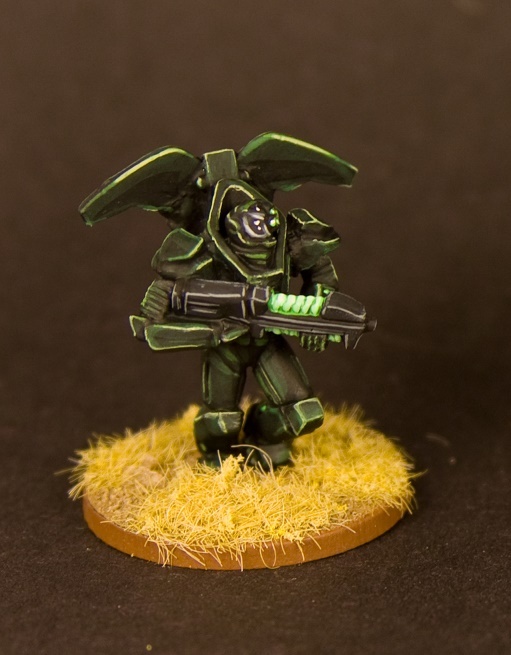 Each HADES Wraith Squad comes with (6) 15mm scaled (approx. 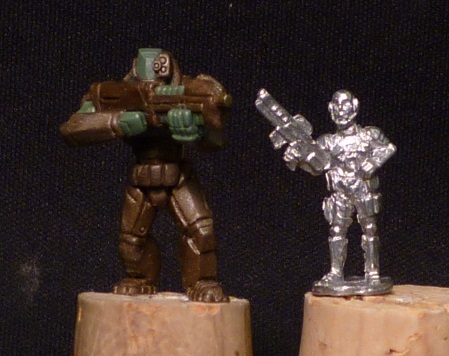 22mm tall) powered armor miniatures in three poses (one with a heavy support weapon), (6) separate heads and (6) separate jump packs. Art by Todd Ulrich, sculpts by Sean Harrison, jetpacks by Jimbo of ACPGames.